Talk N Text gives you new offer. The UNLITXT2ALL. 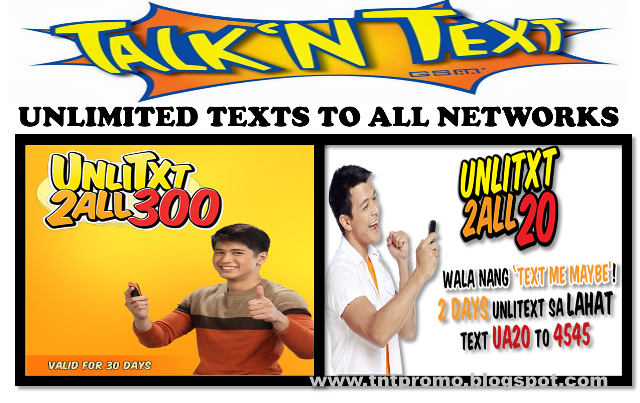 Enjoy sending UNLIMITED TEXTS TO ALL NETWORKS for as low as Php20 valid for 2 days and Php300 for 30 days/1 month. If you want cheap and affordable unlitext to all, choose wisely. Try this. Want to register to this promo? Select your validity and text the following codes. How to register to TNT Unlimited Texts to ALL Networks? Enjoy you 2 days Unlimited Texts to all netwroks! Enjoy you 30 days/1 month unlimited texts to all networks! Please wait for th confirmation message before sending texts messages. Text message will be send if your subscription is over. *Only valid and available to all Talk N Texts Subscribers nationwide. kapag ba globe ano ba maganda promo for 1 month? please make a sort of discount to ua300..
gumagana pa ba ung ua300? year2013 pa kasi post na ito eh..
Anu lang yung gumagana dito ? Badtrip tong tnt 5days yung unli ko pang 2days palng ngaun hindi na ako makapag txt .